Five reasons you should buy "Blogging for Business"
Blogging for Business is the new book by Chris Garrett – a leading UK consultant on blogging and new media. It is, without doubt, the best book on blogging I have seen in ages. Over the years I have bought every book going on blogging and this surpasses even the best of them. For anyone involved in blogging – or considering a blog – this is essential reading. Even if you are a top blogger, you will learn something of value. So, why am I being so effusive? I don’t know Chris personally – though I follow his work. So it’s not personal. I can sell the book as an affiliate so I might make a bob or two. Maybe. But the simple truth is that it is hard to find a book on blogging that is so clear and demonstrates the business benefits of blogging in such an approachable way. Here are my five reasons why this is a “must buy” book. 1. Theory and practice are separated: In many blogging books the theory and the practical are mixed up, making it hard to follow. 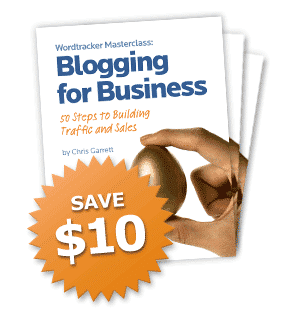 In Blogging for Business Chris has separated the theory and the practical aspects. This means you can quickly get the background information then follow the practical steps. 2. It’s more than blogging: As any successful blogger will tell you, blogging on its own is not the issue. It’s all the other factors such as attracting traffic, retaining readers and making money from them that’s the real source of difficulty. This book takes you into those areas as well and shows you how to use your blog to make money, or generate increased interest in your business. 3. Social media get a look in: Many blogging books are out of date as they don’t look at the use of social sites such as Twitter. This book shows you clearly how to hook up your blog to social networking sites and thereby gain from the latest trends in Internet usage. 4. Action plan included: There is a 50-step action plan. Follow these straightforward steps, use the advice in the book and you will have a successful business blog. As the meerkats would say “Simples”. 5. Thought provoking: Rather than just providing you with a list of things to do and some theory, Chris asks you lots of questions in this book provoking you into thinking about your particular business situation and how blogging fits in. Of course, it’s not all good. There are some problems with this book. For a start it is only available as a download. At 163-pages of A4 you are probably going to need to print it out if you want to follow the action plan steps easily. I printed and bound my copy, but I’d have preferred the option of buying a printed version of the book. Another nit-picking issue I have is the fact that the book doesn’t follow normal publishing convention of always starting new chapters on a right-hand page. That’s because it is an ebook and blank pages would look daft. But when you print it out, it can be easy to miss the fact you are on a new chapter if, like me, you use duplex printing to save paper. Nit-picking I know, but the signal that you are on a new chapter is an important one. Finally, it doesn’t have an index which means using it as a continual reference source becomes more difficult. In spite of these minor issues, though, I can see no reason why any business blogger shouldn’t get this book. Like Problogger, Publish and Prosper, and Start Your Own Blogging Business this book should be on every business blogger’s shelf.